← Ban the Museum Selfie Shtick! 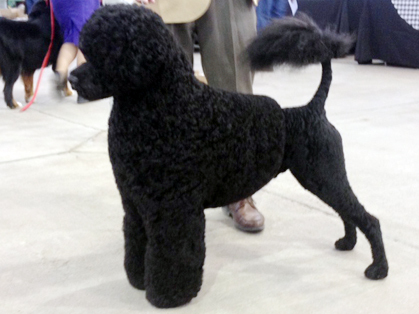 Westminster Kennel Club Dog Show: What the-! Well the Missus and I watched the doggies at the 139th Westminster Kennel Club Show the past two nights and say, it was swell. But we never expected it to be. For starters, we couldn’t stand half of the seven finalists. The favorite, a Portuguese water dog named Matisse, just seemed kind of creepy. Then there was the simpering shih tzu “Rocket,” owned by Patricia Hearst-Shaw (yes, as the announcers said, that Patty Hearst). And, of course, the ever repulsive French poodle. But, against all odds . . . 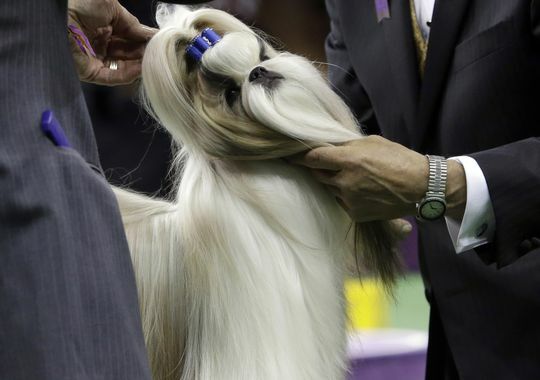 It took 20 minutes for David Merriam, the Best in Show judge at the Westminster Kennel Club Show on Tuesday, to give the dog-loving audience at Madison Square Garden a bit of a shock. 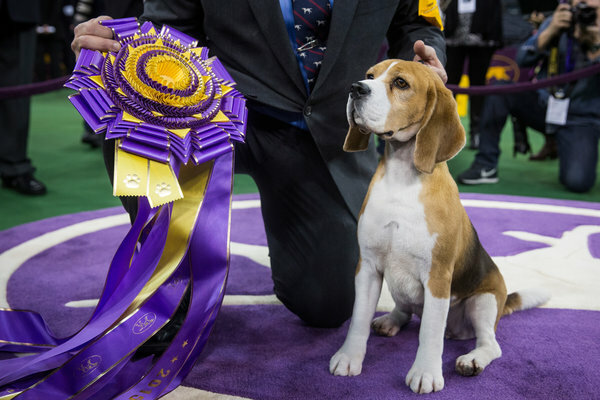 After a devilishly long route to making up his mind — he seemed to enjoy building the suspense, smiling a bit impishly as he deliberated — he made the surprising choice of Miss P, a 15-inch beagle and the grandniece of Uno, the first beagle to ever win the big show, in 2008. Merriam, a retired, white-haired California trial judge, ignored the crowd’s favorite, Swagger, an Old English sheepdog, and two other dogs who were believed to be likelier winners than the nearly 4-year-old Miss P: a Skye terrier named Charlie and a Portuguese water dog with the artistic sobriquet of Matisse. Merry Miss P was not the name on everybody’s snout. This entry was posted in Uncategorized and tagged 139th Westminster Kennel Club Dog Show, Best in Show Judge, Charlie, David Merriam, Madison Square Garden, Matisse, Miss P, New York Times, Old English sheepdog, Patricia Hearst-Shaw, Patty Hearst, Portuguese water dog, Richard Sandomir, Skye terrier, Swagger, Uno, USA Today. Bookmark the permalink. 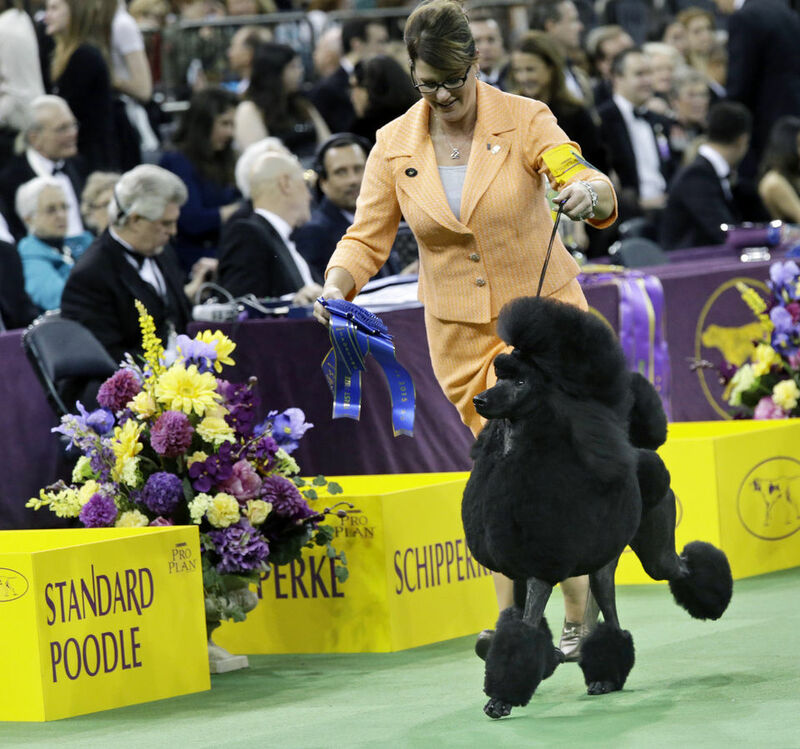 6 Responses to Westminster Kennel Club Dog Show: What the-! Sure – watch every year. And yeah – loved those Subaru ads. The Portuguese water dog? A relative of Obama’s Bo? Does it lie around all the time like the President? Now now, Mudge – just because the Prez used his own initials for the dog’s name . . . But, John…Isn’t it the nature of dogs to lie around….The question is who is the trainer and who is the trainee there. Oh, Mudge – you’re just so . . . Mudgie . . .